Braxton Bragg during the American Civil War. 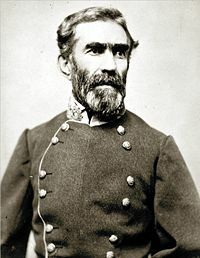 Braxton Bragg (March 22, 1817 – September 27, 1876) was a career United States Army officer and a general in the Confederate States Army, a principal commander in the Western Theater of the American Civil War. Bragg was a controversial figure during the Civil War. While he had an astute military mind he lacked the social skills that were crucial for a field commander. He was often accused of ineptness during major battles due to his apparent inability to make quick decisions. However it is probably closer to the truth to argue his less than engaging style contributed to the disunity of his corps commanders. Bragg was born in Warrenton, North Carolina, the younger brother of future Confederate Attorney General Thomas Bragg. He graduated fifth in a class of fifty from the U.S. Military Academy in 1837, and was commissioned a second lieutenant in the 3rd U.S. Artillery. Bragg served in the Second Seminole War in Florida and took part in the occupation of Texas. He won promotions for bravery and distinguished conduct in the Mexican-American War, including a brevet promotion to major for the Battle of Monterrey and to lieutenant colonel for the Battle of Buena Vista. He gained the respect of General Zachary Taylor. Bragg had a reputation for being a strict disciplinarian and one who adhered to regulations literally. There is a famous, perhaps apocryphal, story about him as a company commander at a frontier post where he also served as quartermaster. He submitted a requisition for supplies for his company, then as quartermaster declined to fill it. As company commander, he resubmitted the requisition, giving additional reasons for his requirements, but as the quartermaster he denied the request again. Realizing that he was at a personal impasse, he referred the matter to the post commandant, who exclaimed "My God, Mr. Bragg, you have quarreled with every officer in the army, and now you are quarreling with yourself!" It is alleged that some of his troops attempted to assassinate him on two occasions in August and September 1847, but he was not injured either time. In the more serious of the two incidents, one of his soldiers exploded a 12-pound artillery shell underneath his cot. Although the cot was destroyed, somehow Bragg himself emerged without a scratch. Before the start of the Civil War, Bragg was a colonel in the Louisiana Militia and was promoted to major general of the militia on February 20, 1861. He commanded the forces around New Orleans, Louisiana, until April 16, but his commission was transferred to be a brigadier general of the Confederate States Army on March 7, 1861. He commanded forces in Pensacola, Florida, and the Department of West Florida and was promoted to major general on September 12, 1861. His command was extended to Alabama, and then to the Army of Pensacola in October 1861. His tenure was successful and along with friend Richard Taylor, he turned his men into some of the best disciplined troops in the Confederate Army. Bragg brought his forces to Corinth, Mississippi, and was charged with improving the poor discipline of the Confederate troops already assembled. He commanded a corps at the Battle of Shiloh and attacked the Hornet's Nest with piecemeal frontal assaults. After the Confederate commander, General Albert Sidney Johnston, was killed at Shiloh, General P. G. T. Beauregard assumed command. On that day, April 6, 1862, Bragg was promoted to full general, one of only eight in the history of the Confederacy, and assigned to command the Army of Mississippi. The next day the Confederates were driven back to Corinth. After the Siege of Corinth, Beauregard departed on account of illness, although he failed to inform President Davis of his departure and spent two weeks absent without leave. Davis was looking for someone to replace Beauregard because of his poor performance at Corinth, and the opportunity presented itself when Beauregard left without permission. Bragg was then appointed his successor as commander of the Army of Tennessee in June 1862. In August 1862, Bragg invaded Kentucky, hoping that he could arouse supporters of the Confederate cause in the border state and draw the Union forces under Major General Don Carlos Buell, beyond the Ohio River. Bragg transported all of his infantry by railroads from Tupelo, Mississippi, to Chattanooga, Tennessee, while his cavalry and artillery moved by road. By moving his army to Chattanooga, Tennessee, he was able to challenge Buell's advance on the city. Once his forces had assembled in Chattanooga, Bragg then planned to move north into Kentucky in cooperation with Lt. General Edmund Kirby Smith, who was commanding a separate force operating out of Knoxville, Tennessee. He captured over 4,000 Union soldiers at Munfordville, and then moved his army to Bardstown. On October 4, 1862, he participated in the inauguration of Richard Hawes as the provisional Confederate governor of Kentucky. The wing of Bragg's army under Major General Leonidas Polk met Buell's army at Perryville on October 8, and won a tactical victory against him. The invasion of Kentucky was a strategic failure, although it had forced the Union forces out of Northern Alabama and most of Middle Tennessee; it would take the Union forces a year to regain the lost ground. Bragg was criticized by some newspapers and two of his own generals, Polk and William J. Hardee, but there was plenty of blame to spread among the Confederate high command for the failure of the invasion of Kentucky. The armies of Bragg and Kirby Smith suffered from a lack of unified command. Bragg can be faulted for moving his army away from Munfordville, out of Buell's path, a prime location for a battle to Confederate advantage. Polk can also be blamed for not following Bragg's instructions on the day before and of the battle. In December, Bragg fought the Battle of Stones River, and nearly defeated Union Major General William S. Rosecrans, but withdrew his army from the field to Tullahoma, Tennessee, after the urgings of corps commanders Hardee and Polk. The attacks upon Bragg started anew and several of his supporters now turned against him. Many members of Bragg's army sought to get him transferred after the battle, citing the failure of the Kentucky invasion and the recent defeat at Murfreesboro, as well as the lack of faith the army had in Bragg, as reasons to remove him. Polk became the ringleader and tried to influence his friend Jefferson Davis through a series of letters explaining that Bragg needed to be dismissed as the commander of the army. William Hardee became Polk's second-in-command, as he set about influencing the officers in the army against Bragg, while presenting a friendly face to him. Davis was unwilling to choose between Bragg and Polk, so he empowered General Joseph E. Johnston, commander of all Confederate forces in the Western Theater, to relieve Bragg of command. Johnston visited Bragg, found general morale in the army to be high, and decided to retain him. Bragg was then driven from Tullahoma to Chattanooga and into Georgia during Rosecrans's Tullahoma Campaign in late June 1863, during which he constantly outflanked the Confederate army of their positions. After William Rosecrans had consolidated his gains and completed his hold on Chattanooga, he began moving his army into northern Georgia against Bragg's army. Bragg began to suffer from inattention to his orders by his subordinates. On September 10, Major Generals Thomas C. Hindman and D.H. Hill refused to attack the outnumbered Federal column under Brig. General James S. Negley, as ordered. On September 13, Bragg ordered Leonidas Polk to attack Major General Thomas L. Crittenden's corps, but Polk ignored the orders and demanded more troops, insisting that it was he who was about to be attacked. This lost time and delays enabled Rosecrans to collect his scattered forces. Finally, on September 19 and September 20, 1863, Bragg, reinforced by two divisions from Mississippi, one division and several brigades from the Department of East Tennessee, and two divisions under Lt. General James Longstreet from Robert E. Lee's Army of Northern Virginia, turned on the pursuing Rosecrans in northeastern Georgia and at high cost defeated him at the Battle of Chickamauga. This was the greatest Confederate victory in the Western Theater during the war. After the battle, Rosecrans's Army of the Cumberland retreated to Chattanooga, Tennessee, where Bragg laid siege to the city. He chose to use the victory to rid himself of his enemies within the army and managed to get Polk and D.H. Hill transferred. Bragg blamed Polk for the numerous occasions in which he disobeyed instructions. Hill, one of the many generals who were allies of Polk, became outspoken against Bragg so much that Jefferson Davis removed Hill from command and canceled his endorsement for Hill's promotion to lieutenant general. Things came to a boil in the Confederate high command in the aftermath of Chickamauga. Some of Bragg's subordinate generals were frustrated at what they perceived to be his lack of willingness to exploit the victory by driving the Union Army from Chattanooga and pursuing them. Polk in particular was outraged at being relieved of command. You have played the part of a damned scoundrel. … If you ever again try to interfere with me or cross my path it will be at the peril of your life. With the Army of Tennessee literally on the verge of mutiny, Jefferson Davis reluctantly traveled to Chattanooga to personally assess the situation and to try to stem the tide of dissent in the army. Although Bragg offered to resign to resolve the crisis, Davis eventually decided to leave Bragg in command and denounced the other generals and termed their complaints "shafts of malice." The Union Army was eventually reinforced and commanded by Major General Ulysses S. Grant. Grant broke the siege by driving the Confederates from their commanding positions on Lookout Mountain (the famous "Battle Above the Clouds") on November 24, and Missionary Ridge the following day. The Battle of Chattanooga at Missionary Ridge resulted in a rout with the Confederates narrowly escaping total destruction and retreating into Georgia. The loss of their hold on Chattanooga is partially attributed to poor placement of artillery; instead of locating the guns on the military crest, they were placed on the actual crest of the ridge, allowing the approaching infantry to remain concealed. Bragg, under advice from Davis, sent James Longstreet and his divisions, as well as Simon B. Buckner and his division, to Knoxville, Tennessee, to lay siege to Major General Ambrose Burnside and his forces located in the city. This move was gladly accepted by Longstreet, and Bragg believed he could prevent Burnside from marching to Grant's aid. Only after the Confederate collapse at Chattanooga did Davis accept Bragg's resignation and replace him with Joseph E. Johnston, who commanded the army in the Atlanta Campaign against Sherman. In February 1864, Bragg was sent to Richmond, Virginia; his official orders read that he was "charged with the conduct of military operations of the Confederate States," but he was essentially Davis's military adviser without a direct command, a post once held by Robert E. Lee. Bragg used his organizational abilities to reduce corruption and improve the supply system. He reshaped the Confederacy's conscription process by streamlining the chain of command and reducing conscripts' avenues of appeal. Later he commanded in turn the defenses of Wilmington, North Carolina, the Department of North Carolina and Southern Virginia, the defenses of Augusta, Georgia, the defenses of Savannah, Georgia, the defenses of Charleston, South Carolina, and in January 1865, the defenses again of Wilmington. His performance in the Second Battle of Fort Fisher caused the loss of the latter city, but he managed to escape with the bulk of the garrison and win a small victory at Kingston. Near the end of the war he served as a corps commander (although his command was less than a division in size) in the Army of Tennessee under Joseph E. Johnston in the Carolinas Campaign against Sherman and fought at the Battle of Bentonville. After Lee's surrender at Appomattox Court House, Bragg accompanied Jefferson Davis as he fled through South Carolina and into Georgia. After the Civil War Bragg served as the superintendent of the New Orleans waterworks and later became the chief engineer for Alabama, supervising harbor improvements at Mobile. He moved to Texas and became a railroad inspector. In September of 1876, Bragg was strolling along a street with a friend in Galveston, Texas, when he suddenly toppled over and died instantly. A local legend tells of a mysterious light near the place of his death, which is called Bragg's light. He is buried in Magnolia Cemetery, Mobile, Alabama. This page was last modified on 23 June 2016, at 15:20.